So in 2 days I will be at Lollapalooza. I am very excited, not just for myself, but my 15 year old me. Let me explain. In 1994, I discovered Alternative Nation. 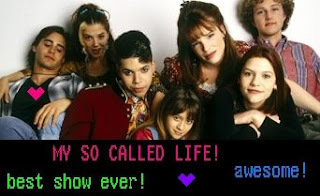 It was on MTV from 12am-2am on Saturdays, and being as I was so cool, it was "my thing" for Saturday. It was my one ritual (okay, my second ritual, my first being watching My So-Called Life on Tuesdays with Dominos pizza- I was SO Angela and wanted to be her, but it would actually be years before people commented on how much I looked like Claire Danes). I would record videos I liked and watched them over and over again. It was my first glimpse at Beck, NIN, Sonic Youth, James, etc, etc. I LOVED Nine Inch Nails and was totally in love with Trent Reznor. I had a lot of the obscure Halo CDs. I remember wanting to go to Woodstock that year because Nine Inch Nails was playing. I also remember my friends going to Lollapalooza that year. I wanted to go so badly, but for some reason I couldn't go. I think it had something to do with money/room in the car, but it wouldn't have mattered, my parents were very strict and wouldn't have let me go anyway. You might say, "You don't know that that is true". Yes, I do, my Mom actually said she wouldn't have let me go and she is nervous about me going THIS year. Seriously. Now, I am making up for lost time, going to Lollapalooza AND seeing Nine Inch Nails! It almost makes me want to put on a flannel and overalls. Of course NIN is playing at the same time as Kanye West, so my 29 year old self is pissed about that. My 15 Year Old Me. The choice in Headbands and braided hair have a reason- we were going to look funny and go to Meijers! Fun! Awesome! I have cropped everyone else out to protect them, but they don't look much better than me. The real fashion crime here? I was very skinny here and I am wearing two big shirts, my Dad's pants, and- wait for it- boxer shorts and underwear underneath. I don't know why I thought that made me grunge, I just know that it made me look about 20 pounds heavier. omg, i just smiled ear to ear reading that...you have JORDAN CATALANO on your blog *sigh*.